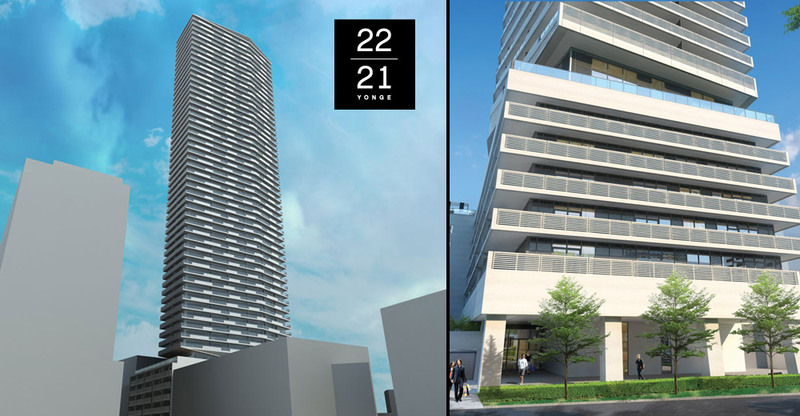 2221 Yonge Condominiums is opening new vistas and setting the new standard for urban living. Located at Yonge and Eglinton just steps from the Yonge Street subway and the future Eglinton LRT, Tower Hill Development Corporation is creating a buzz with this 50 storey tower set on a six-storey podium. The design from Munge Leung features cantilevered wraparound balconies with sophisticated suite layouts. The amenities are top of the line and include a 56th-floor Sky Lounge, fireplace lounge, barbeque dining areas with stunning cabana, and a private dining room. The project is crackling with innovation and excitement. Prices start from $199,900. From 386 square ft. Studios to 977 square ft. 3 Bedrooms. Tower Hill Developments has been creating residential communities for nearly 70 years and is renowned for such iconic Toronto structures as the Park Hyatt and the Sutton Place Hotel. They have consistently chosen outstanding locations in the cities top neighbourhoods. Their stellar reputation has attracted the best designers and architects to their projects. Choice of designer selected high performance wide plank laminate flooring in main living areas. Contemporary custom Kitchen cabinetry designed by Munge Leung with choice of designer selected Caesarstone countertops and ceramic tile. The long extra-wide lobby extends the entire length of the site to connect the Yonge Street and East entrances. The lobby is further enhanced by a large sloped garden, visible from outside on Yonge Street. An avant-garde Wet spa located on the lower level includes three separate experience plunges–a warm pool, a hot pool and a massage pool, sauna, steam rooms and private treatment rooms to help nurture downtime in a Zen-like environment. The spectacular 7th floor amenities space offers a spacious indoor enter tainment facility that includes a fully equipped chef’s show kitchen with a private dining room with a double sided fireplace to the bar lounge, a fireplace lounge and several smaller lounge areas. The Halo Rooftop Terrace with an outdoor terrace features breathtaking views of the city. The casual lounge area and wet bar create the ideal spot for a nightcap, for entertaining or for a romantic night under the stars.